When your applications require a more sophisticated operator interface and process control capability, GSE Models 560 and 562 deliver enhanced performance and value. 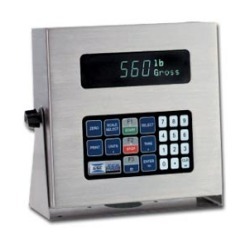 GSE 560 Series Scale Controllers offer unparalleled performance in a sophisticated digital weight indicator. Equipped with a comprehensive parameter map, programmable features and a multiple option modules, the GSE Model 560 series from Central Carolina Scale is the indicator of choice of applications that require value, quality and performance. 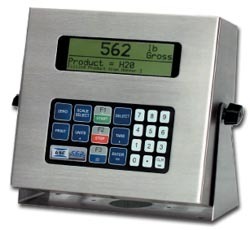 The 560 features a VFD, 7 segment, 0.75" (19mm), 6 digit weight display and the 562 features a LCD, 8 line x 40 character graphic display, backlight, 3 font sizes. 100 programmable data registers can be defined as an integer, unsigned integer, float or string, common data registers include part number, lot #, Operator ID, commodity code, etc. A factory default transmission will send: Gross, net and tare weights. Using the Custom Transmit Tables, other transmissions may be programmed to send weight data, Data Registers or ASCII control codes for application specific labels, reports, etc.